Being with the Millers was definitely like being home. Another taste of home we got (while being physically over 1,300 miles away from our sticks and bricks home) after a 4 hour drive we were able to see our niece Sidney! This is her first year in college and we’re so happy we got to see her and tour her campus. It’s a beautiful campus! The dorm rooms are super small, so I’m glad she likes her roommate. I think her room is the size of singles where I went to college. “Sweet home Alabama” is what it said on the sign as we drove by whooping and yelling. I knew being at the Miller’s house would be fun, but I never imagined what was to come. First of all, I had no idea they had a dog, much less three! It was insanity! And awesome! And I loved every minute of it! And I’m fresh out of exclamations! 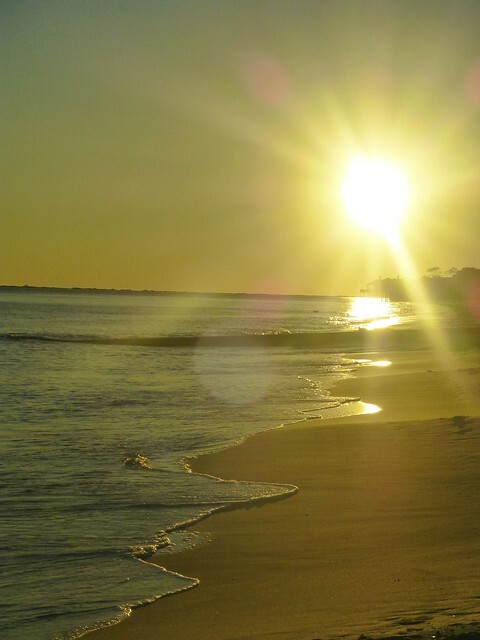 Anyway before I get to that I’m going to go back to Daufin island. It was really fun on Dauphin Island. We were in walking distance of a beach so obviously we went there more than once. We went there about 3 times I think. The first time we were just playing around with the waves and Dacen was digging holes in the sand. The second time was about the same. Then one day we went to this place that was like an aquarium. One difference was that for free you could go at to a thing called the touch tank. It had a hammer head shark, some rays and another sort of things that look like rays. It was cool touching the shark school touching the rays, but the shark was just especially awesome. It wasn’t as big as you’d think. It was pretty small. Almost as long as my arm. After we got kind of bored of petting the shark and the others, we decided to go to the beach. This time the waves are a little bit bigger and we decided to make a kind of Lake by just digging in the sand. After our first failure I decided to try something new. I started building a wall of sand around the lake. It kept out all the water until one really big wave got in. But didn’t flood for a long time. Once it was time to go we sped up the process of destroying the wall. That was just as fun as building it in some ways. Okay so next we went to Mobile Alabama where the Millers live. As we pulled in 3, count them 3 dogs came to greet us. Two medium sized ones and one great Dane. Bill and Karen brought us in and the adults just chatted for a while as we played with the dogs. The dogs were really fun but the Great Dane named Luke was a big baby. He is only 9 months old so he gets that. He was already huge so I can’t imagine what he’s going to be like when he grows up. Finally, Bill said “Alright! Who’s ready for a boat ride?” I sprinted to the boat and was the first one in. We fvshoomed across the river but then had to slow down because of a marina and bridge. Its a good thing we didn’t speed up because we never would have seen the dolphin. My mom shrieked! Dolphin! It got so close I almost could’ve touched it. That was an amazing experience. When we sped up the waves made it bumpy which was super fun. After a while we got to a restaurant and ate this really good food. Then we got boiled peanuts, lost Karen’s pants, and headed back. I was really excited for the next day, because we would be at the Millers’ house while Mama and Papa had a night on the town. I could hardly sleep that night because it was gonna be AWESOME!!! basically we got there and we played with the dogs again but when dinner was ready, we got to eat in front of the TV. The only TV dinners I’ve had is when we go to a sports bar and football and hockey are the only things that are on. Don’t get me wrong, I love football and hockey, but that isn’t the same as a good old-fashioned TV dinner. we probably watched, like, four hours of TV. The next day we woke up and headed to Florida. 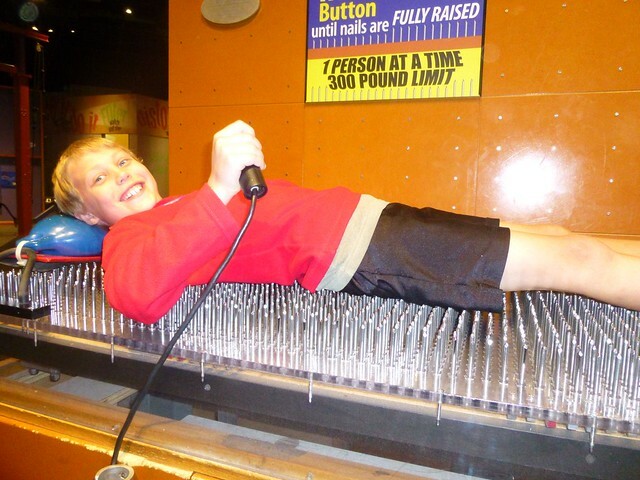 When we walked in the center we saw THE BED OF NAILS!!!!! Caden went first, I would’ve gone first but I wanted to see his expression. The science is, your weight balances out on each nail. For example, you weigh 100 lbs and you are on 50 nails, only 2 lbs of your body is on each nail, like an elephant. An elephant has feet about 10 square inches and weighs 1 ton, each square inch on the foot would be holding only 50 lbs. While we stayed with the Millers we parked Ava in a vacant lot owned by their neighbors. We considered taking it to their house but it would have been a challenge to park and this vacant lot was a breeze. But the area seemed slightly sketchy. I thought about moving the bikes inside the trailer but figured that 3 cable locks would be enough. Before we went to visit my niece in Birmingham we stopped by the rig to get some stuff. I could see something hanging loosely at the back of the trailer, my heart sank, and when I rounded the back of the camper….all 4 bikes were there (Brielle’s gets stored in the basement). However, someone had cut the ropes and taken the bungees off…so there was at least an attempted theft. Oh I was fuming mad that someone would do that…I just don’t understand the mentality of taking other people’s stuff. But I’ve had a pretty nice life so maybe I just don’t get it. We moved the bikes inside the rig so they would hopefully be more secure. By the way, 4 out of our 5 bikes were purchased on Craigslist…these are used bikes…no titanium frames, kevlar belts, plutonium filled shocks, etc…just plain ol used bikes. My niece (also my God daughter) is attending Samford University in Birmingham…they love the Governor (come on, sing it with me….”Ooooo oooooo oooo”). So we decided we were close enough to make a day trip up to see her. Its a 4 hour drive from Mobile but Steph did some of the driving so I could get some work done. We met Sid on campus and she gave us a tour of her dorm, her room and campus. I still remember holding her when she was days old and now she’s a college student…wow!! After a quick bite at Subway we went to the McWane Science Center on a suggestion from both Sid and her dad…plus our Denver Museum of Nature and Science pass got us free admission. Sweet! Bill and Karen Miller were super nice, they took us out on their fishing boat. Before the boat ride, I thought, we were going to go slow. But when we got on the boat, we had to back out of the dock, turn around, get going, then BAM! We were going 50 knots or (55 mph) 1 knot is 1.13 mph.There was a buoy that said NO WAKE! near some docks and fancy stores and restaurants. Karen told us that that meant we had to slow down so we didn’t make a wake that would damage another boat. We also had to be slow as we went under the bridge. I first met Bill Miller at bootcamp several years back (exactly this time of year too). We were randomly placed at tables for meal time and Bill and I were put at a table together. That weekend had a huge impact on me as I believe it did for many men including Bill. Long story short, Bill and Karen Miller served our church and community in so many ways…it seemed like they were involved in everything. Then one summer day in 2014 I’m riding my bike home from work and I pass them riding their bikes out by Golden Ponds. We chat for a bit and I share with them our family’s plan to travel the country in a 5th wheel. Turns out, they’ve done the same thing….several times! Bill ends up in a major leadership role in our church’s construction project to build a new facility while at the same time he and Karen buy a house in Mobile AL and sell their one in CO. And that is how we came to plan a stop in Mobile AL on our adventure across the USA. I can’t find the words to explain how great this day was! It was peaceful and exciting and fun and relaxing and just filled me up!! I was so excited to see Bill and Karen Miller. They are friends from church who had just moved full time down to Mobile, AL. As much as I love traveling and seeing new places, I also realized a couple of weeks ago that the familiar is super nice! I was looking forward to hanging out with them. They had offered a few ideas of things to go do and see. 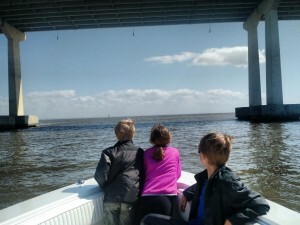 We had a lot of big days of site seeing just before that in New Orleans, so I decided a day on the boat would be fun and then just hanging out with them would be great. 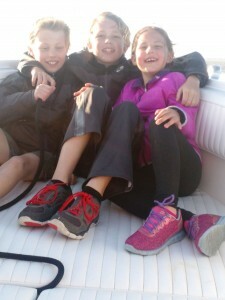 Some down time was needed and a boat ride would be new and different for the kids. They live right on the water and I LOVE the water! 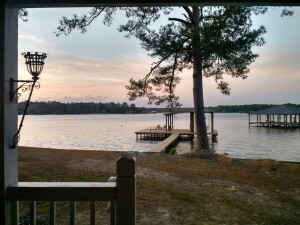 Their house is so lovely with a wonderful, peaceful view of the water that borders two sides of the house. 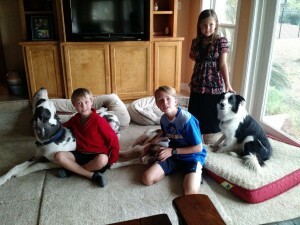 Oh and they have 3 dogs – one for each of our kids to love on! 🙂 I can totally see why they live here! The boat ride was even better than I expected! And the kids each said the same thing. We had such a blast! It was fun watching the kids enjoy it. Everything from the wild bumps to laying down, almost napping during the calm. I had no idea how far we were going or how long we would be on the boat. I was happy with whatever Bill and Karen had planned. 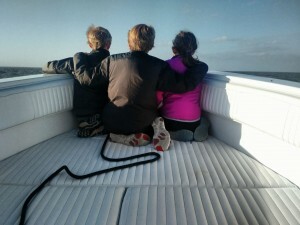 We started down the Dog River and they said we would go out on Mobile Bay as they often saw dolphin there. I thought to myself “pleeeeease let us see a dolphin!” And a good look would be really great too!” I still had no idea how big the Bay was. Right when we entered the Bay – and I mean right when we entered – a dolphin appeared right next to the boat! And then it surfaced again even closer! I barely missed recording it both times on my phone – darn. But it was soooo cool! It really was a fabulous welcome to the Bay. Somewhere along the way I’d heard about Dauphin Island and since its close to Mobile where we have friends we wanted to visit we decided to check it out. We made reservations for 3 nights at the campground on the island. Its a pretty decent campground and the price was fair (more than a state park but less than many private parks)…it helped that we just had a water and electric site with no sewer. Lots of campers seem like they are here for a long time….not full time, but snowbird types. But the crown jewel of this campground was that it was just a short walk to a really nice beach. Dacen covered the details of our time on the island pretty well in his blog post but here I’ll throw in a few thoughts of my own. Well, we didn’t actually swim with sharks, but mom really wanted to take us to an estuary.It was supposedly 2 miles to the estuary around along the coast of the Gulf of Mexico and back to Ava. It only felt like 1 mile though. At the estuary we all really enjoyed it, but I enjoyed it the most. In the touch tank (which was about 50 feet in circumference, about 3 feet deep, and was filled with saltwater) there were all fish. We were allowed to touch the animals in the well named touch tank. There was a hammerhead which was very kind, lots of sting rays which loved to cling to walls of the touch tank, sea skates which loved to stay at the bottom of the touch tank, and lots of other fish that we didn’t know what types they were. Do you like squares? I like Nike. We learned that sharks, sting rays, and sea skates do not have a swim bladder so they have to move at an angle up and down and side to side at an angle, unlike fish who do have a swim bladder so they can swim straight up and down and side to side. In Mobile Bay, there are 17 discovered species of sharks. Sting rays have a more round body and give life birth and sea skates have more of a triangle body and lay eggs. However, they both have barbs on there tails. On the walk to the beach we saw lots of pelicans…one was eating a snack.